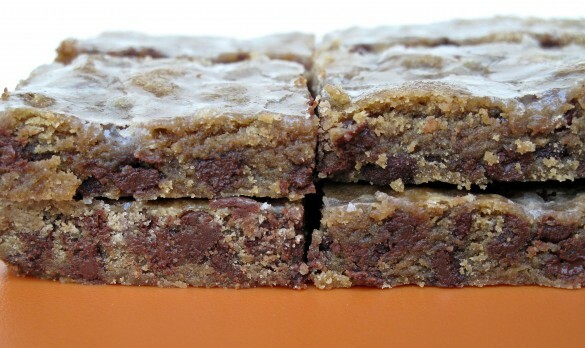 Iced Espresso Bars are a cookie bar for coffee lovers. The soft, chewy bars are full of chocolate and coffee flavor. A crisp cinnamon glaze is a delicious finishing touch. 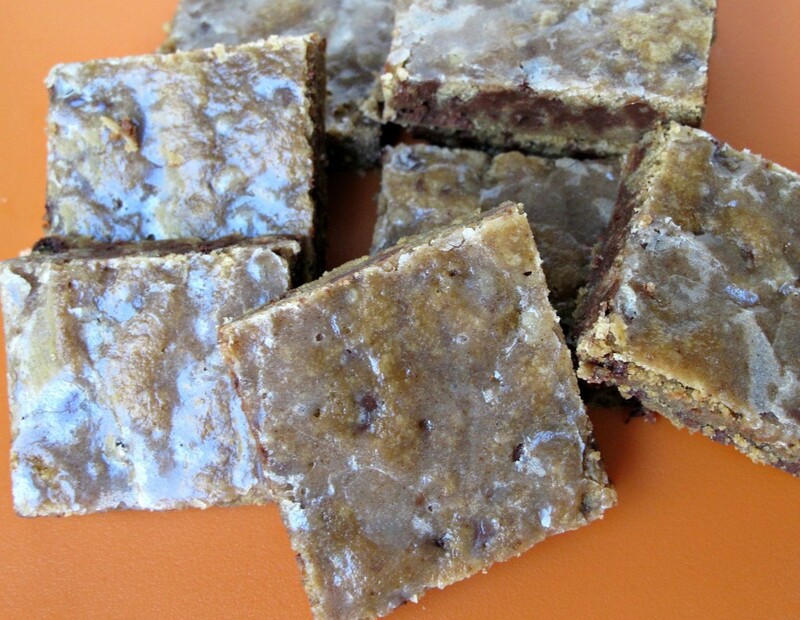 Luckily the recipe makes plenty for sharing with some left over for you to enjoy! Long, long ago, when dinosaurs roamed the earth, I was an undergraduate education major. During my sophomore year I did a practicum in a 3rd-6th grade classroom taught by a talented and extremely knowledgeable master teacher. I did my best to soak up his methods and approaches, hoping that someday I would be able to emulate his teaching style. I was in awe. One day, during a break in the action (when the kids were in P.E. ), this master teacher asked if I would like a cup of coffee. Somehow I had made it to the age of 19 without a taste for anything stronger than a cup of Earl Grey, so I politely declined. Even to this day, I am relatively sure he was serious when he responded, “You’ll never make it as a teacher if you don’t drink coffee.” From that moment on I worked diligently (and rather successfully) to develop a love for coffee. Espresso even. The stronger the better. No milk and no sugar. For better or worse, I seem to have passed this love of coffee on to my Main Monday Box Recipient, the college sophomore. One of his first care packages this year, was a shipment of Madagascar Vanilla coffee beans from Kaldi’s in St. Louis. (If you like vanilla flavored coffee, you have to try this stuff. It is wonderful.) 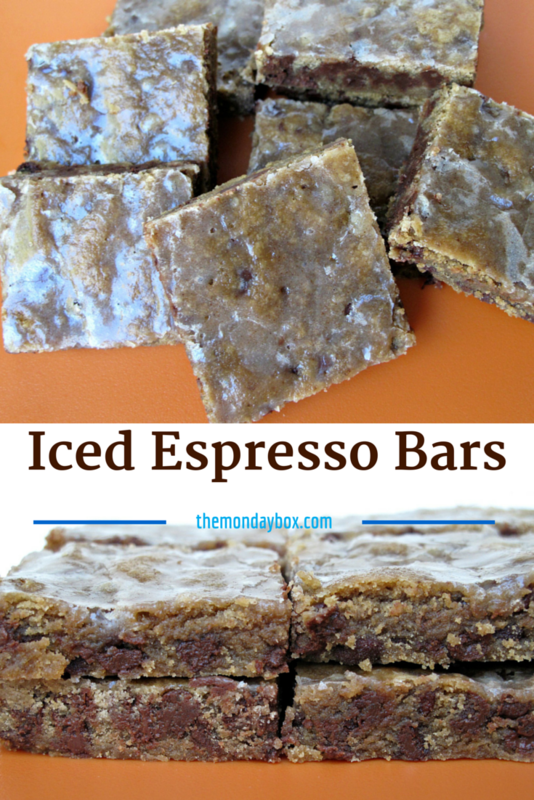 So when I found this recipe for Iced Espresso Bars I had a feeling they would be a hit. 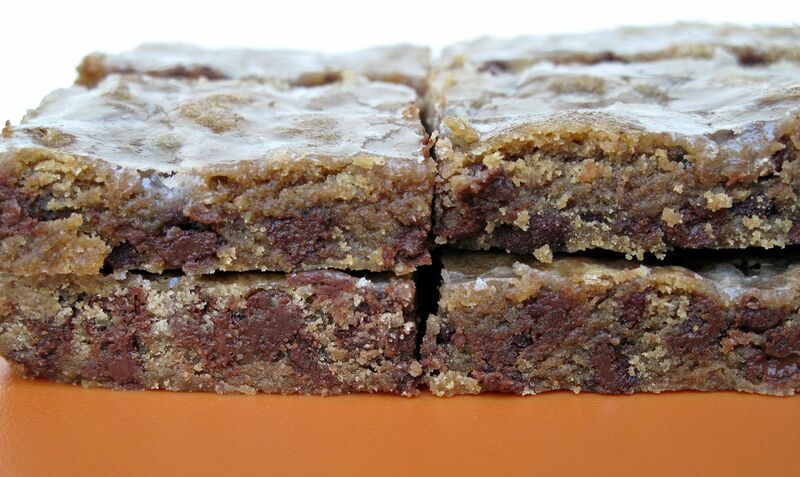 Iced Espresso Bars have a soft, slightly chewy texture. They are sweet but I think that the glaze is important to the overall flavor and texture. Don’t skip it. 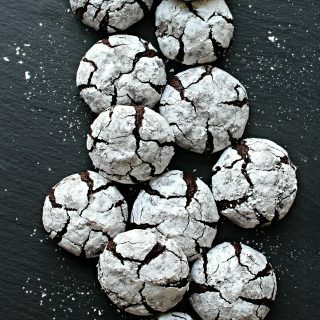 The recipe emphasizes to use espresso or coffee powder, not granules. I used espresso powder from King Arthur Flour but my regular supermarket carries jars of espresso powder in their coffee aisle. I have never looked for coffee powder. Most instant coffee that I can remember is in granule form. Also, I once tried to substitute Starbucks Via for espresso powder in another recipe and it was awful, bitter and inedible. I don’t recommend it. 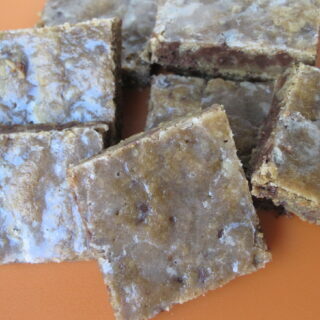 Wrapped in plastic, Iced Espresso Bars kept well on the counter for 3-5 days. I bet they would remain fresh even longer if kept in the fridge. Preheat oven to 375 degrees F. Line the bottom of a 10×15 jelly roll pan (baking sheet with sides) with parchment paper. In bowl of electric mixer, cream together butter, brown sugar, espresso powder, and vanilla. Add the flour mixture to the creamed ingredients and mix until combined. Dump the dough onto the prepared pan. Cover the dough with a sheet of wax paper the size of the pan, and using your hands, press the dough evenly up to all edges. Remove the wax paper. Bake for 5 minutes, then rotate the pan and bake for an additional 5 to 10 minutes until the edges are just beginning to brown. Cool in the pan for 5 minutes then glaze. GLAZE: Combine milk, butter, powdered sugar and cinnamon in a small saucepan over medium heat stirring constantly until bubbly and smooth. 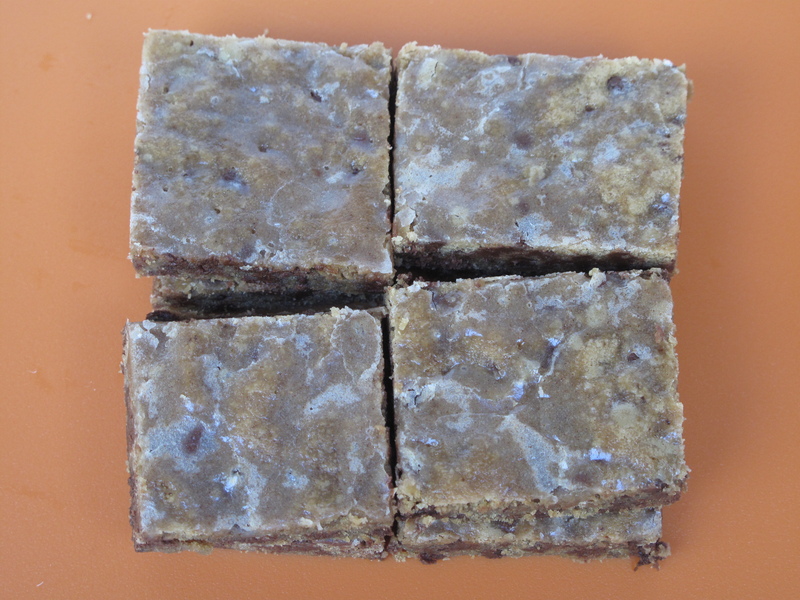 Pour over barely cooled bars and spread evenly with a spatula. Cut into bars when the pan is warm but not hot to the touch. Cool completely on wire racks before wrapping or storing. Wrap bars individually or in 2’s in plastic wrap. 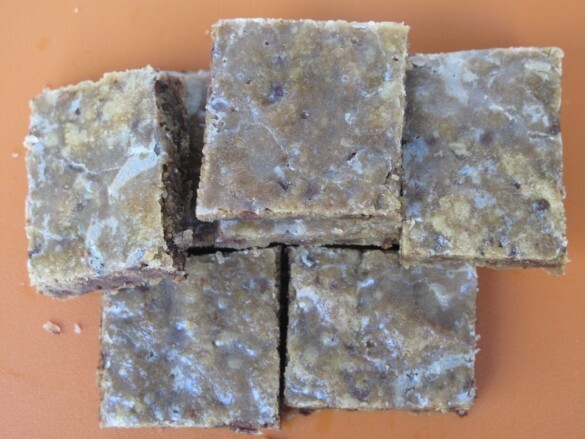 Store the individually wrapped bars in an air-tight container for 3-5 days. For longer storage refrigerate. Before mailing, place individually wrapped bars in a large zip lock bag for extra freshness protection.